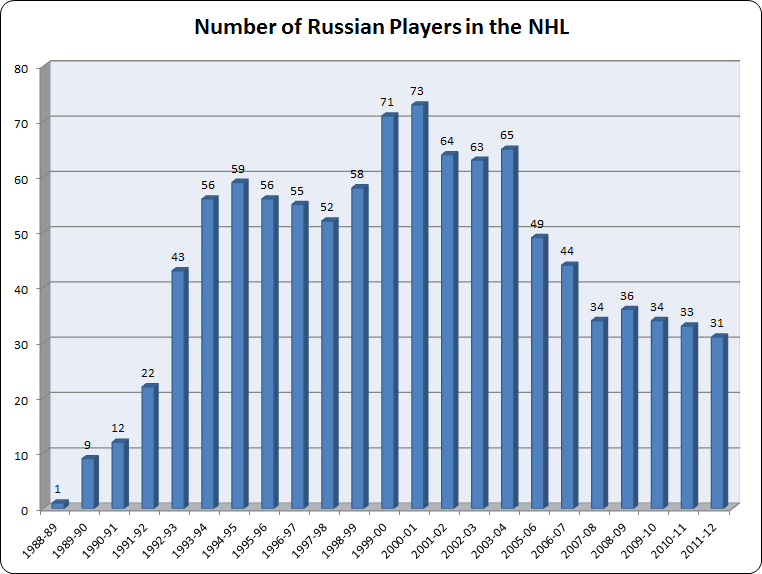 Ovechkin, Fedorov, Mogilny, Kovalchuk, Yashin, Bure, Malkin, Datsyuk, Radulov -- names familiar even to the most casual hockey fans, some more successful than others, but as we look at the statistics the number of Russians in the NHL is dwindling. (a) By now we’ve all heard the stereotypes, lazy, selfish, lacking heart, egocentric, unmotivated after receiving big contracts and more concerned with finding the next Kournikova than winning NHL games. But is this reputation justified or is it just North American media bias? Even though Evgeni Malkin had a great season winning the Hart Trophy as MVP of the league, the 2011-12 NHL season will more likely be remembered for the all too typical shortcomings that most Russian players face in the playoffs. Malkin’s Penguins disappointingly lost in the 1st round, same for Datsyuk’s Red Wings, Ovechkin well-used to early round failures surprisingly made it to game 7 of the 2nd round but that’s as far as his career has gone so far. More embarrassingly, Coach Hunter thought it would be a benefit to the team if Ovechkin played fewer minutes thus being less of a liability to the team. Ouch. Radulov, coined the best player outside of the NHL, who was supposed to take the Nashville Predators to new heights in the playoffs was suspended for breaking a team curfew during their series with the Phoenix Coyotes which they eventually lost 4 games to 1. Ilya Kovalchuk, the poster boy for overpaid Russians who’ve never really won any meaningful NHL games finally got a chance at a long playoff run thanks to being part of a winning organization. Unfortunately, the only thing he could muster was an empty net goal in the 2012 Stanley Cup finals when the New Jersey Devils lost to the Los Angeles Kings. Another year and another non-Russian lifts the Conn Smyth Trophy as the MVP of the Playoffs, that makes it 22 out of the last 23 years. Although in my opinion the voting does tend to favor North American players it is still a rare occurrence for a Russian NHL player to put his team on his back and actually lead them to a Stanley Cup Championship. 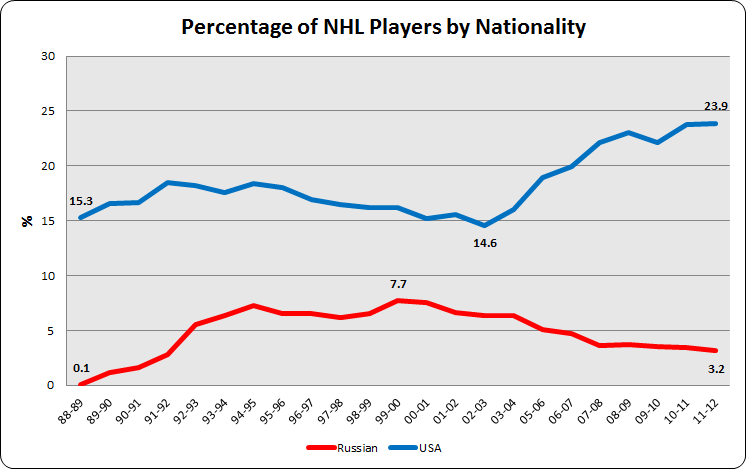 So what is the cause of this downward trend in Russian NHL players? 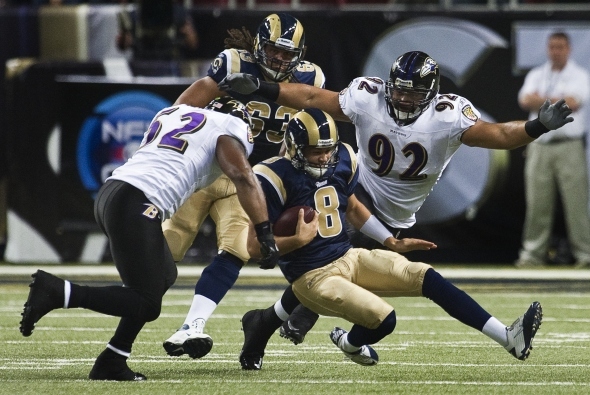 Has the talent pool become thinner? Has their negative reputation finally caught up to them? 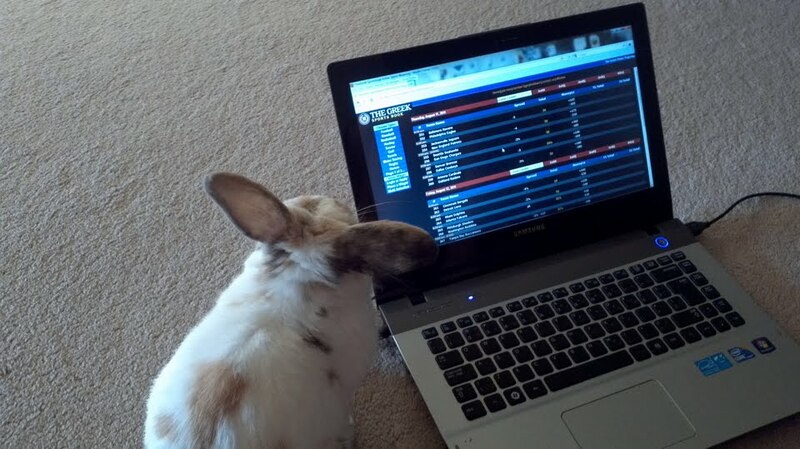 Is the KHL (Kontinental Hockey League) that big of a factor? Are Americans simply developing better players? Or is the 2004-05 NHL lockout partly to blame? It is impossible to say which variable has had the most influence on this topic as it’s still up to debate and a matter of opinion but the most realistic answer is a combination of all of these over time which has reduced the number of Russian players in the NHL. Most pundits these days say the KHL is the main culprit however the league was not “founded” until 2008, while the exodus of Russian hockey players started after the 2000-01 NHL Season. 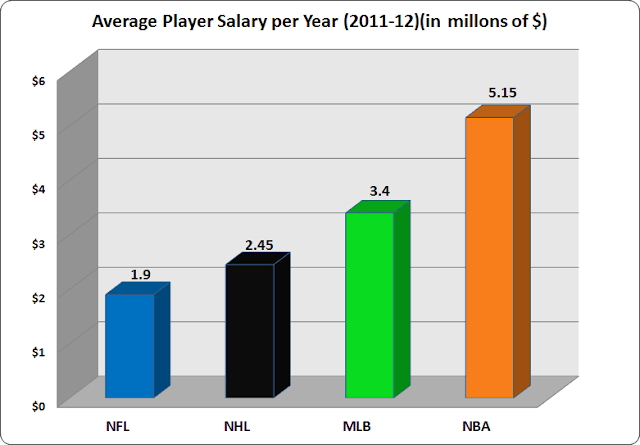 One major reason which is often overlooked is the change in development of American hockey players who have become better suited for the current style of the NHL and can offer similar production without all the extra baggage. Another forgotten reason is the 2004-05 NHL lockout during which many players like Aleksey Morozov went to play in Europe and never came back to the NHL after the lockout ended. This can clearly be seen in graph (a) where a huge dip occurs during this exact time period. The 2012 NHL Draft could prove to be a pivotal one as it marks only the third time a Russian (Nail Yakupov) hockey player has been drafted #1 overall. There was a time when Russians outnumbered Americans at the NHL Draft (1992, 1995) but now they have fallen behind Sweden as Europe’s top country in the number of NHL draftees. Once the top players (Malkin, Ovechkin, Kovalchuk, Datsyuk) retire, the future could look really bleak if there’s no top-level talent to replace them. 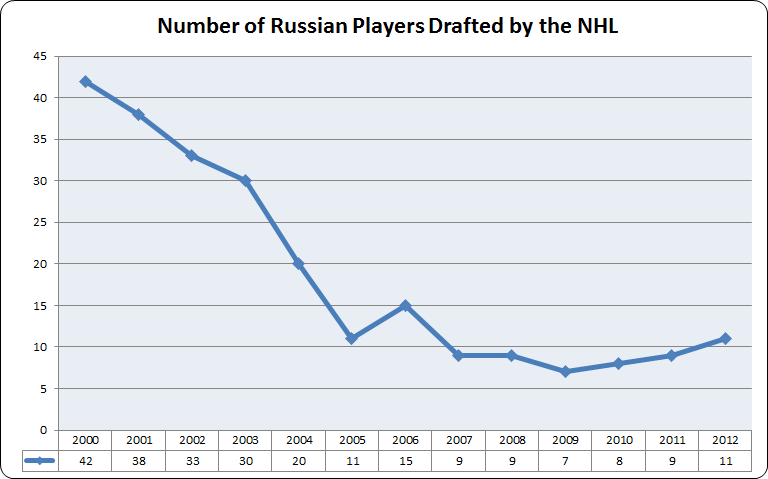 After the great 2004 NHL Draft there has been very little to get excited about as there have been zero Russian players drafted in the top 5 between 2005-2011. While my views may sound biased, you would be surprised to find that many of my favourite hockey players over the years have been Russian. 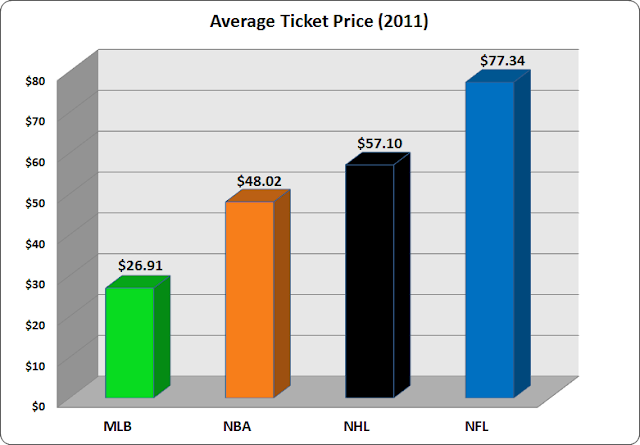 Diversity can be good for most sports leagues as a product can quickly become stale for audiences who see the same type of players over and over again. 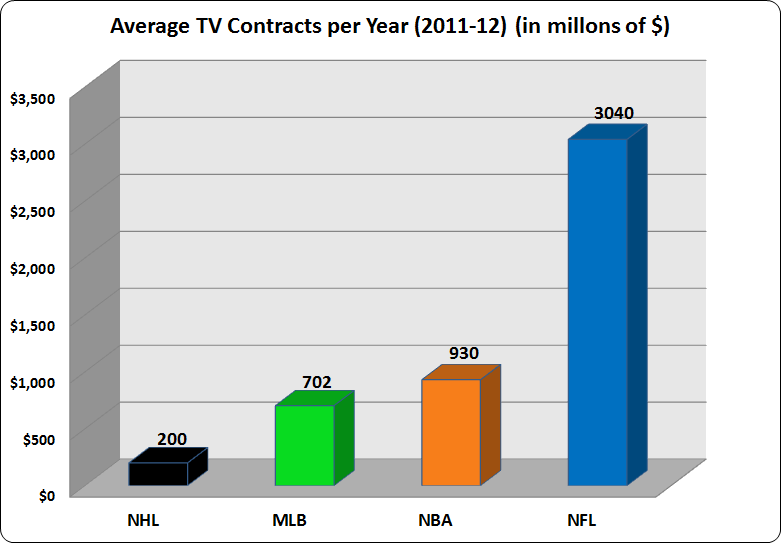 Thus, a complete disappearance of Russians in the NHL would be rather disappointing to many hockey fans. 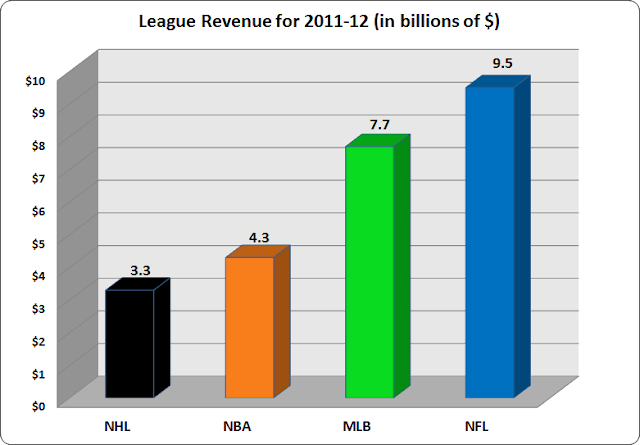 Opinions are one thing but statistics are another and at the present time they show little hope in reversing the current NHL trends. 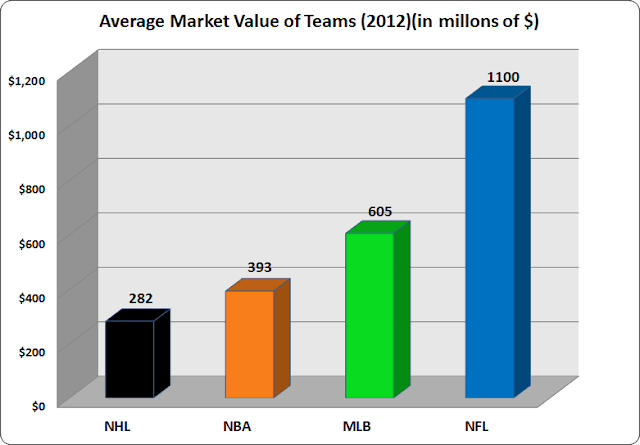 The future of the hockey landscape is up to debate but it will be interesting to see what these graphs will look like in many years. Feel free to leave your comments and opinions, if you enjoyed this article and would like to receive future updates from our website please subscribe below.